Turns out properly trained dogs can, in fact, smell remains of humans hundreds, if not thousands, of years old, due to their mind-boggling olfactory system, which is made up of 220 million smell cells, compared to just 500 in humans. That realization caused Morris to start the nonprofit Institute for Canine Forensics, which now employs about 12 “human remain detection” dogs and their owners to search for long lost bones in historic cemeteries, villages, and battlefields. “These aren’t search and rescue dogs,” said Morris, who explained that finding alive or recently deceased humans is much easier because of the array of scents. 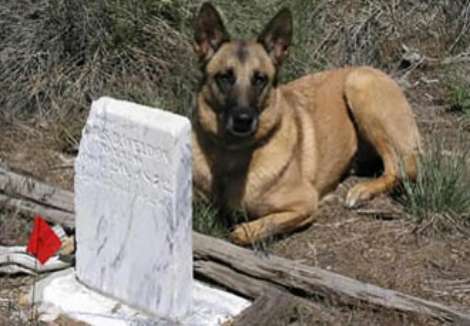 “These dogs are trained specifically for historic and prehistoric graves.” The searches are conducted for both commercial ventures, such as construction sites that need to avoid disturbing sacred places, and purely academic investigations, such as in historical parks that want to find burial plots and for archaeologists who need hints on where to start their excavations. Morris and four of her canine friends will share their stories Sunday, September 7, at 2 p.m. at El Presidio (123 E. Canon Perdido St.) in Santa Barbara. While they’re in town, the S.B. Trust for Historic Preservation, which runs El Presidio, will have the dogs search their property for unmarked graves. While there are 51 known burials beneath the chapel, three of which have been excavated, the trust’s archaeologist Mike Imwalle said there are another 77 recorded in the historically named Presidio cemetery, but no one knows where. For more on the Institute for Canine Forensics, visit k9forensic.org. For more on the September 7 talk at El Presidio, visit sbthp.org or call 965-0093.